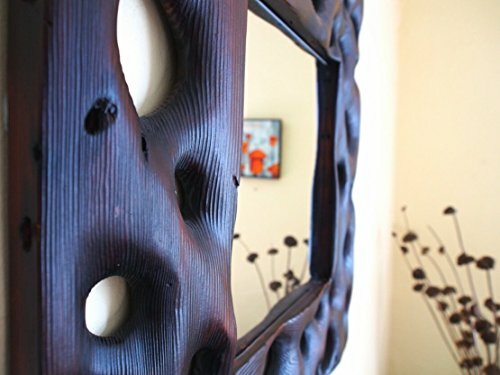 This mirror frame is built using reclaimed Douglas fir. It is hand carved and then torch-burned to bring out the grain and to highlight the subtle variations of color. It will be a fantastic addition to any entry way, living room, or gathering place. The mirror and frame is approximately 2 feet high by 2 feet wide. The mirror itself is 1 foot by 1 foot with slightly less than that as visible mirror. The frame is set up so that you can hang it with any of the four edges being up.